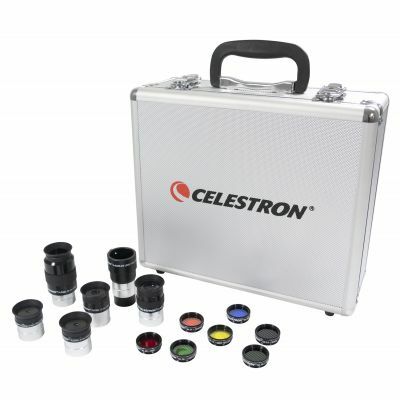 This useful accessory kit contains everything necessary to get started in visual astronomy at a fraction of the cost of purchasing the items individually and should be considered with every telescope purchase. As the accessories included greatly expand the capabilities of any standard telescope package it also makes a great gift either alonside a new telescope or for someone who has recently purchased a new telescope. This Eyepeice and Filter kit is our Number 1 selling telescope accessory and for good reason. Five Superior Grade Plössl Eyepieces - 1.25” — 4-element design with a 52° AFOV (32mm has 44° ) — Superb color resolution, edge sharpness and clarity. All eyepieces are fully multi-coated for maximum contrast and resolution. Supplied are a 6mm,8mm, 13mm, 17mm, and 32mm. Barlow Lens - 2x 1.25”— Compliments the Plössl eyepieces in this kit and gives you a total of ten power combinations. High grade glass optics with fully multicoated lenses are used so there is no degradation of image. Six Colored Eyepiece(Lunar & Planetary) Filters - 1.25” — Included are Kodak Wratten #12, #21, #25, #56, #58A, and #80A. Since you have all the eyepieces necessary to study the planets and moon in detail, these filters will greatly enhance your enjoyment of our solar system. Moon Filter - 1.25” — A neutral density filter which allows you maximum enjoyment of the moon especially during the brighter phases.